As our baby horse progresses up the training tree, we’ve given him a solid base of trust. We work with rhythm and relaxation doing anything we do from catching him to grooming him or putting on his leg wraps or giving him some play time before we put his tack on. He’s comfortable with us and the general pattern of the work we do together. When we first got on his back, we allowed him to move with complete freedom, never interfering with or restricting his natural gaits. The next step is to get him working with freedom of gait while seeking and accepting contact with the rider’s hands. When we’re talking about contact, we’re talking about an even, steady, elastic connection between the rider’s hands and the horse’s mouth. It’s easy to get side tracked by the terminology here because everybody uses it a little bit differently. “Elastic” is probably the best descriptive term because what we call contact isn’t a single point somewhere. It involves a whole lot of dots we have to connect from the horse’s mouth to the bit to the reins to the rider’s hands and elbows and shoulders and then through a whole circle of the rider’s muscles and the horse’s muscles. So if we say “seeking the bit” or “soft elbows” or “straight reins” then someone might focus on just one point and miss the bigger picture. For contact to be elastic, the rider has to be relaxed. Otherwise, their hands or their elbows or some part of them is going to be set and rigid, not moving as the horse is moving. If the rider isn’t relaxed enough to follow the horse’s motion, the horse is going to get bumped in the mouth. The rider’s hands and elbows aren’t immobile because that would bump the horse’s mouth, too, as his neck and back flex with his motion. They are quiet. Or some people say soft because that helps other people remember not to allow any muscle tension there. Hands can’t be quiet and steady until the rider has developed an independent seat. He or she doesn’t need to tense their leg muscles to keep their balance or hang on the reins to keep their balance. So their relaxation isn’t going to disappear the moment the horse makes some bigger move underneath them. So we’ve got our baby horse moving freely around in the arena and as he gets used to the feeling of carrying our weight he starts to relax. His neck muscles relax, then his back muscles relax and the horse just naturally starts stretching down. Up to this point, the rider has just been allowing whatever the horse offered and keeping a loopy rein. There hasn’t been any interference from the rein that in any way discouraged or limited the horse’s forward motion. The rider’s just been sitting there relaxed, following the motion with a quiet hand, allowing the baby horse complete freedom of movement. As the horse relaxes and offers that stretching, he takes that loop out of the reins. The rider then shows him a soft, elastic connection between his mouth and the rider’s hands through the bit and the reins. The rider is still allowing freedom of gait, still not interfering with the horse’s natural forward motion. Gradually, our baby horse begins to connect the dots. When he moves forward, stretches down and seeks contact, he gets a little steadying support from the rider that helps him balance himself and carry the rider’s weight a little more easily. But there’s still no interference, no restriction of his movement. Now the important thing to remember here is that the horse is going to look for this contact himself. You’re not going to say, “Today’s the day.” You’re not going to pick up the reins and reach for a feel of the horse’s mouth or hold it or pull on it and say now you have contact. Contact comes from the horse working with rhythm and relaxation while being allowed the freedom of his gaits. And with that, he begins to relax his neck and back under the rider’s weight and stretch down. He starts looking for the rider’s hand a little bit to help him steady himself and deal with that weight. The rider has to wait for the horse to offer that himself. Then the rider’s going to be there to give him a little support in front. With the first three steps on the training tree rhythm, relaxation, and freedom of gaits the horse is really just getting accustomed to being comfortable around the rider, comfortable working with the rider, and comfortable carrying his or her weight. Now we’re adding contact, we’re starting to show the horse that we want him to move forward freely. Generally, a baby green horse that was a clean slate when you started is going to take 6 to 9 months to reach this stage. Some horses are going to reach this stage sooner than others. Some are going to take longer depending on their athletic ability or their history, things you might have to be working with that happened to them in the past. It’s important to allow the horse to progress at his own rate. Otherwise, you may find yourself coming back to this point when the horse’s progress starts falling apart farther down the road. 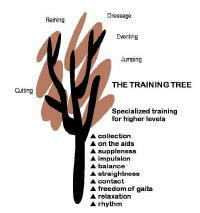 The nice thing about having a training tree built on a sequence of horse-logical steps is that when you get in trouble or the horse quits making progress, you can start all over again at the bottom and work the horse back up through each of the levels until you find the sticky spot. Then you have to stay at that level and fix the problem before the horse can make progress again. I happen to think it’s just easier to do it right in the first place, but that’s my opinion.